Buckle-Down's iconic Seatbelt Belt is a cool, smart, and exciting blend of fashion and function. Always a conversation starter, our Seatbelt Belt adjusts to perfectly fit your waist while showcasing your unique sense of style. Our Seatbelt Belts are made with authentic automotive style seatbelt buckles making them easy to open and close at the push of a button. Our Seatbelt belts are 1.5 inch wide and are infinitely adjustable for pants sizes. This product is Handcrafted in USA by Buckle-Down Inc. and Officially Licensed by Transformers. 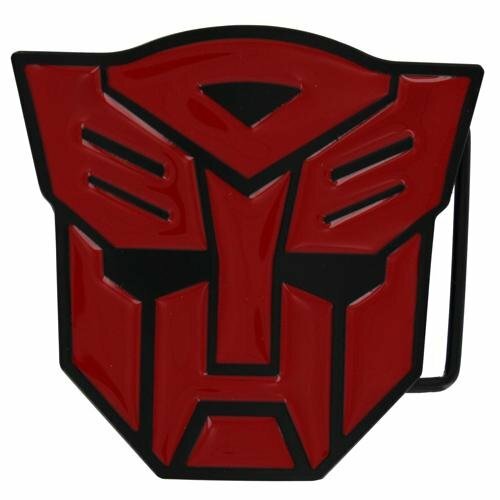 This cool belt buckle is great for fans of the good transformers, the Autobots. In the shape of a red Autobot logo. Enamelled metal. Fits most standard sized belts.